I Lose Words! Where do they go? There has been quite a bit of talking the last few days from MCSGal and mcslearningtoliveadifferentlife about what our canary is and about losing words when in a reaction. I posted this originally on June 23, 2012 and then posted it again in my Catch-Up Mondays on July 28, 2013 with the title At a Loss For Words. I still lose words despite the length of time it has been since my original exposure at work. I lose words during a reaction and when I am not in a reaction. The mold just messed with my brain. I have difficulty typing certain words. Despite being able to write these words and spell them to you out loud I type them wrong every single time. I want to type a blog post and not correct anything in it and let everyone see how I truly type before I take the time to go back and make corrections. One of the words that I spell wrong every single time is you. When I type it is always appears as yoiu. I have been very far behind in posting new blog posts. I have many ideas but just can’t seem to get myself back to the task of writing. Instead I have been cleaning house, something that is routine and helps me deal with all that has happened. I promise to be back soon in full swing soon. In the meantime there may be some reblogs of some amazing bloggers I follow and a few extra Catch-Up Mondays. Don’t you just hate it when you lose or can’t retrieve the word you want from your brain? Since becoming ill I have found it is a regular occurrence. I will be talking to someone and in the middle of a sentence I can’t come up with the word I want to use. Try as I might, the word won’t come. Sometimes I have been successful by trying to find another word that means something similar. In the middle of a reaction as I was in yesterday, I was hard pressed to come up with the other word. What was the word you say? I don’t know. I still don’t know. I was trying to convey how when dealing with someone I would just respond very vaguely without giving either a yes or no answer. As I was searching for the word I became tearful. I tried and tried and finally came up with equanimity (calmness, poise, serenity, self-possession). It seemed to work but wasn’t really the word I wanted to use. Maybe I was wanting to use apathetic (showing little or no emotion, indifferent, not interested or concerned). As I am writing this definition I think that is the word I wanted to use. As hard as I try to retrain my brain by reading, crossword puzzles, etc. I still lose words in conversation even more so in the midst of a reaction. I still find when I type that I transpose the same letters in certain words over and over again even though I know how to spell the words. 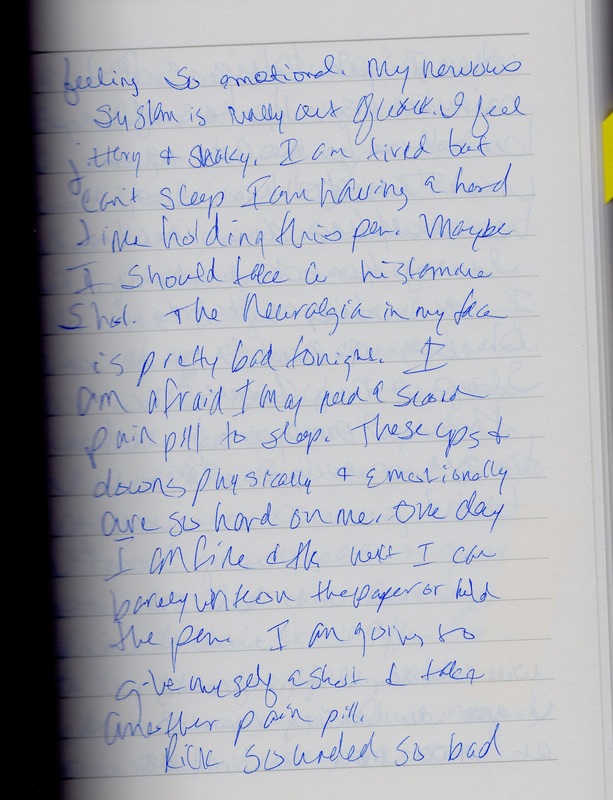 Yesterday when I was in the reaction my handwriting became hard to read (see picture for a sample of my handwriting in my journal during a reaction) and I spelled things wrong, my right hand became very cold and I had a much harder time expressing myself. I have been told that mold mycotoxins can damage brain cells. Sometimes you regain some of the processes you lost but usually not all of them. When I was first exposed to mold (didn’t know it then) I would take phone messages and then look at them and realize they didn’t make sense and have to re-write them. Sometimes my boss would come in and ask me what the message meant even after I am sure it had been rewritten. My handwriting was also deteriorating . At the time I would become frustrated over this but it never dawned on me that something serious was going on with me and my brain. My fellow blogger friend, MCS Gal, has a blog posted titled “What is Your Canary?”. I read it and immediately commented. This has led to numerous comments back and forth. Please check out her blog post and leave a comment. Don’t forget to leave a comment here as well on what your canary is! I first posted this on February 3, 2013. How many of us hold on to things for emotional reasons? The item has not value. It may not even be safe. But it has that special memory that tugs at your heart. In my case, it was a special memory of a time long ago. I time before illness and sensitivities to fragrances and other chemicals. Just reading this post saddens me but it needs to be said for all those out there in similar circumstances. I have tossed out so many things since my mold exposure at work and subsequent cross-contamination of all my belongings at home. I have tossed out books that I loved, tossed out all of my clothes and shoes, watched as my husband tossed my old one-eyed panda teddy bear and Scottie dog from childhood, gotten rid of my computer which was less than a year old and placed all my photos away for future scanning by someone other than myself. Yet I still have this little tiny bottle of perfume. Have I ever worn it? No. Is it a small vial of a very expensive perfume? No. Do I even know what it smells like? No. Then why am I holding on to it? When my husband and I got married in 1976 I had chosen the perfect gown. It was a candlelight color and I fell in love with it. I had gone to the bridal salon in plenty of time to get fitted and order the gown. My mother and I had been told the gown would be ready in eight weeks. Eight weeks came and went and my gown was not in. Finally twelve weeks after I ordered the gown, I received a call at work. I was so excited. The gown was in and ready for me to try on. I phoned my mom and she met me there. The dress was taken out and given to me to try on. It was more than a size too small. They had misfit me or inadvertently ordered the wrong gown. What was I going to do? It was barely over eight weeks until my wedding and this gown had taken twelve weeks. They offered to place an other order and said the gown would be here on time. I told them to do whatever they wanted. Tearfully I walked out to my car. What was I going to do? That weekend my mother and I drove out-of-town in search of a gown I would like that we could purchase off the rack. We searched and searched and I “settled” on a gown. It wasn’t the gown I wanted but time was running out. We purchased the gown and the woman gave me this lovely little bottle of perfume to take with me. I didn’t wear the perfume on my wedding day but this little bottle has been sitting on my dresser or table in my bedroom and moved from house to house with me all these years. Why haven’t I gotten rid of it? I honestly don’t know. I have never opened it, never wanted to wear it and now could never wear it. I guess there is something about it that brings me back to a happier time. Today as I was talking with a friend about loss of belongings because she has found some mold in her house and is worried that she, like I, will have to get rid of clothes and other “things” (things that hold memories of a time long gone). I told her about my piles of black garbage bags that sat on the floor as my mother pulled all my clothes and shoes out of my closet (pictures will be in the book), etc. Then I mentioned the lone little vial of perfume that I have sitting in my bedroom on my dresser. Suddenly, after all these years a horrible and earth shattering thought came to my mind. Why do I have that in my bedroom? Yes it has never been opened and no fragrance or chemicals are being emitted from it. But what if? What if for some unknown reason, that innocent looking little vial of perfume were to fall on my hard tile floor and shatter. All those chemicals would be thrown into the air of my safe bedroom. How could I not have thought of this before? It is amazing what giving up possessions and memories can have on a person and make them totally “INSANE”. So what happened to that beautiful little bottle of perfume that held so many memories? My younger daughter took it outdoors far away from me and dumped out the perfume. She then gently packed it up in a bag with paper towels and took it home with her to Texas. She will be the guardian of what means/meant so much to me. At least it didn’t have to end up in the refuse dump with all my other treasures from what feels like a life time ago. I need to have her send me a picture of where it now resides. What are you holding on to? What about it makes it so painful to let go? I first posted this on November 16, 2012. This topic is one that is hard to grasp but I have been asked more than once why this could be happening. The toxins in the mold, mycotoxins, cause a great deal of damage to our systems. Only after we remove ourselves for a time do we truly see what has happened and it is not what we are ever prepared for. How many of you who have suffered from a mold exposure and asked this same question? What happened? Why am I more allergic and feeling worse? 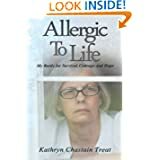 The simple and yet not so simple answer is that it can take 2-12 weeks for your body to get the toxin and load level down enough after removing yourself from the constant exposure to recognize all the allergic responses the mold has caused. You feel better immediately because you are no longer being exposed. Then the allergic response kicks in and you suddenly realize that things that were never a problem before suddenly are. The mycotoxins have done their damage and now you are becoming aware of what those damages are in the increased sensitivities and other illnesses that crop up (fibromyalgia, chronic fatigue, chronic sinusitis, autonomic nervous system dysfunction and severe depression to name a few). I stopped working in the moldy environment and thought I was feeling a little better but then I was placed in a new school building where construction was going on and dirt was being moved everywhere for landscaping. I began getting exposed to the mold spores in the dirt (my air filter cartridge by my desk needed to be changed after two weeks rather than the usual 2-3 months). I was being exposed to toxic paints, toxic glues in the carpet as well as high levels of formaldehyde in the carpet and all the new furniture. I was also being exposed to the dust from construction. A few months later I went to the Environmental Health Center-Dallas where I was not exposed to chemicals or fragrances of any kind. Slowly I began to notice smells when I went to the grocery store and would become dizzy after a short time in the store. I was still wearing my clothes that I had worn in the work environment. Fast forward about 8 months and I had a urine tricothecene test done which revealed a high amount of tricothecenes in my urine. I was told to get rid of my clothes. I did and then headed for Dallas for surgery. Between removing my toxic uterus and ovaries (my ovary we learned later had 125 ppb of tricothecene mycotoxin in it), anesthesia and starting over in safe clothes I became even sicker. I began noticing that when I got near mold or someone who still had their clothes from their moldy homes I would go into tremors. I experienced these tremors when testing molds and mycotoxins. My chemical sensitivities and food allergies were also heightened. The worst of this happened about six weeks after my surgery. Friends of mine have told me the same stories. Some had this happen exactly at 8 weeks; some had it happen just before week 12.